I have just spent weeks trying to decide what I might do for holidays this year. It always seems sad that we have to work so hard the whole year for a holiday. What about a break in between all those days? What if you could get on a boat and go overseas for the weekend? In Sydney, you can and that’s what I have in mind here. The Sydney beachside suburb of Manly seems to be the perfect place for a weekend or even a long weekend trip “overseas”. Just so you know, Manly is a half an hour ferry ride from the centre of Sydney but when you arrive at Manly wharf you could be at any beachside holiday destination. It feels like you are in an entirely different city. The cafes and restaurants are a drawcard but so is the beach, the coastal walks and the festivals. See if you can spend a weekend in May when the Taste of Manly is on or in October when The Manly Jazz festival hits the street. Well you know I am all about food so, to me Manly’s cafes and restaurants seem to be offering a lot of the hottest food trends from around the world. 3. Showbox Coffee This is the place for a seriously good coffee and my kind of interesting food. It’s small and just off the main drag but hunt it down at all costs. 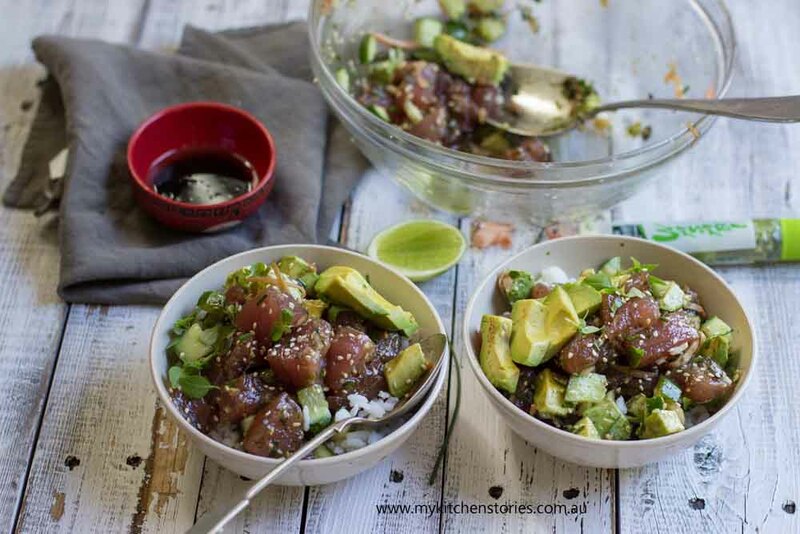 This is one of the few places in Sydney selling Poke, a popular Hawaiian dish (Check out my How to make Poke HERE). Maybe you’d like to try their Raw Pad Thai salad with zucchini noodles, poached chicken, peanuts, ginger and fermented cabbage. HERE, now that is a trend. 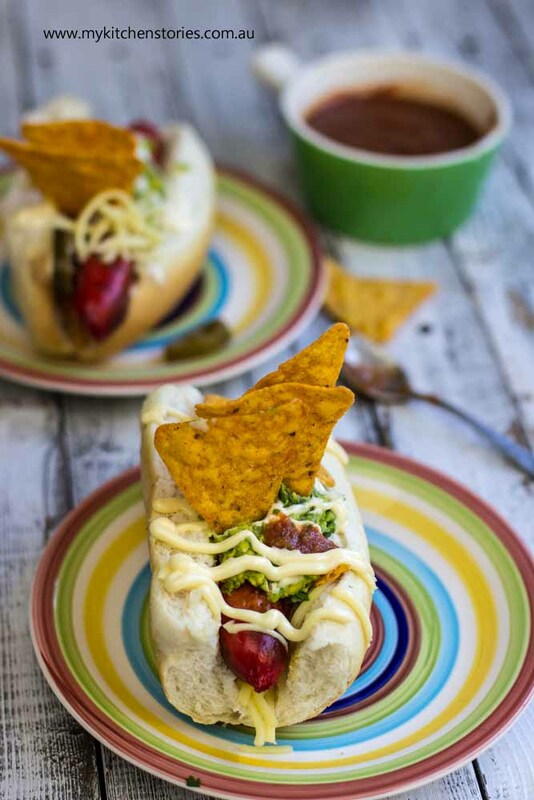 Now back to the Nacho Dogs. Salsa:. Put all of the ingredients into a food processor and blitz. Leave some texture by not puréeing till smooth. Crema: Mix the sour cream and Mayo together. Tip into a small zip lock bag or plain plastic bag and snip a tiny whole in the corner. This can be used to squirt the sauce onto the Dogs. Cook the sausages on a grill pan so they taste smoky and get some nice grill marks. these could be done on the BBQ too. Guacamole: Squash the avocado with a fork. Stir in the lemon, cumin and salt. To put the Dogs together 1/2 the rolls without cutting all the way through. 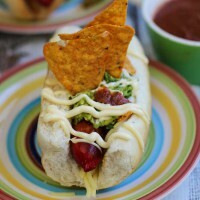 Next, the secret is to crunch up some corn chips and put them into the buns before adding cheese and then hot sausages. Spread a tablespoon of Guacamole on each one, top with salsa and Jalapenos. Squirt with Crema and finish with some extra chips on top. What a fun and creative combination! Thanks for the link love Tania! And we went out west on the weekend because it felt like we were in a different country. It’s so nice to be able to get little breaks while not leaving your own city. Lorraine @ Not Quite Nigella recently posted..Meet My Suburb: Summer Hill Food Tour! Oh thats no good still she could have gone anywhere thats what happens on holidays . 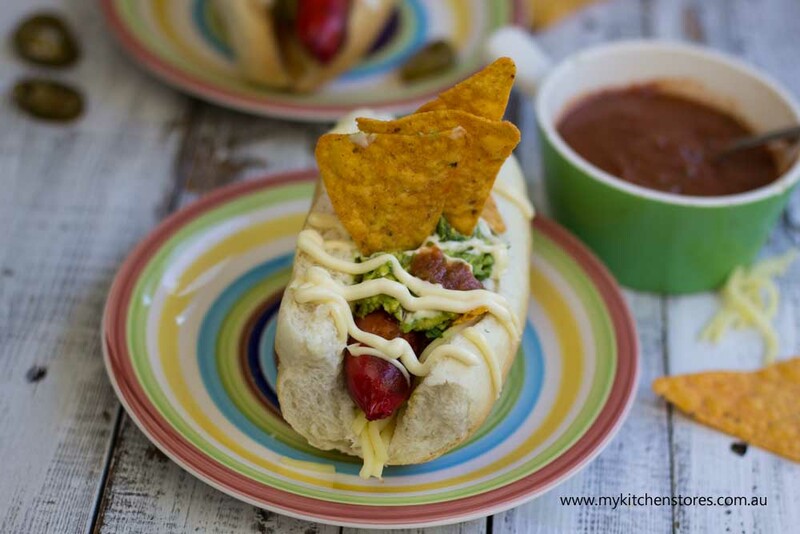 Nachos and hot dogs – what a winning combination! I love going to Manly but I haven’t been to any of those places although Papi Chulo is top of my “Places to Eat” list! I don’t want my frozen meal dinner anymore, I want THAT! Karin @ Calm to Conniption recently posted..The Ultimate Rabbit Hole #62: I’m Back! 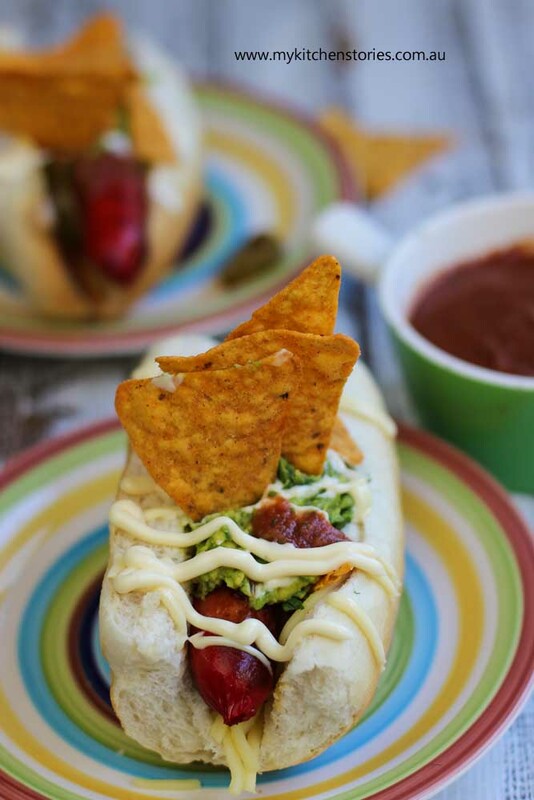 As a hot dog aficionado, kinda sorta, I thought I’d tried hot dogs of every stripe. This nacho dog, however, is a new one. Never heard of it, let alone tried one. I am definitely going to do something about that. They sound great, Tania! I love me a good dog recipe. This is a nice twist on it too. I love a good Slaw Dog which I learnt from my Aunty in the US. One of my dads all time favourites. But we are big mexican dish fans in this house so this would be a great combo of both loves.